Before walking into an evening of theater that is an adaptation of something, you get the choice to research the source material or go in blind. I chose to enter blind. And I’m glad I did. Lunar Energy Production’s Before Placing Me On Your Shelf is a collection of generously smart scenes using the words of Pulitzer-Winning poet James Tate. Not knowing the source material, I was able to listen to Tate’s language and discover a thru-line within the piece, despite the occasional and unfortunate pigeonholing. There were consistent themes and images used throughout the play that connected the poems to one another helping to create a play. Shelf was at its finest when the scenes touched the absurd. Sure the narratives appeared realistic, the situations were not. 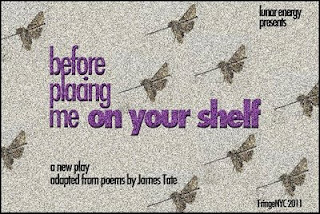 From duct tape to moths to the silly items used to fix a speaker, Tate’s poems served for a great absurdist piece of theater. The ensemble of seven, led by standouts Caitlin Johnston and Josh Odsess-Rubin, worked nicely with each other, never allowing for a dry or dull moment. From a production standpoint, Philip Gates used his space perfectly. Walking into the Kraine Theater, there seemed to only be two entrances and exits. Suddenly an actress appeared magically via a revolving door with moth-like silk decorations behind her. The ingenious use of the three revolving doors was a strong choice that made the simple black box theater more enticing. I continually wished for someone to appear and reveal the silk. Gates, who directed and conceived Before Placing Me On Your Shelf, lifts Tate from page to stage in a way most directors dream of doing though rarely succeed. He guides his troupe on a thought-provoking journey through Tate’s world. The only thing I wish that Shelf had was a more cohesive costume design. The costumes seemed to be static and what looked best from the actors’ closet. Overall, if you’re looking for a unique theatrical experience, head over and see Before Placing Me On Your Shelf.